Despite sharing similar desires to become transit corridors between Europe and Asia, Kyrgyzstan and Mongolia have been unable to prioritize new railway projects, whereas Kazakhstan is moving far ahead by building new railways connecting Chinese, Iranian and Russian rail networks. With the newly built second railway connection on the Sino-Kazakhstani border in 2012 and the Kazakhstan-Turkmenistan-Iran railway link in 2014, Kazakhstan is developing into an important transit hub and is diversifying its markets in natural resources and agricultural products—especially wheat (see EDM, May 20). Kazakhstani railways, for instance, now serve as critical rail links between the southeastern Chinese city of Zhengzhou and Hamburg, Germany, as well as the Chinese inland city of Chongqing and the western German city of Duisburg by providing a shorter, quicker and cheaper transportation route (China Daily, July 19, 2013; Xinhua, April 8, 2014). In contrast, new railway projects have been delayed in Bishkek and Ulaanbaatar, mostly because of conflicting local agendas. For one thing, the leadership in Bishkek is wary of this east-west railroad, fearing it could deepen the conflict between the Kyrgyz Republic’s Uzbek-dominated south and the rest of the country. The government worries the railroad would disproportionately increase economic benefits to Kyrgyzstan’s secessionist southern provinces (oblasts), thus providing them with greater leverage against the center. Secondly, the railroad would overwhelmingly benefit China and Uzbekistan; and Bishkek perceives both these countries with suspicion. Specifically, thanks to the east-to-west railroad through southern Kyrgyzstan, China would gain an additional inland route to Eurasia, South Asia and, most importantly, the Middle East. Moreover, the railway corridor would provide China with greater access to gold, aluminum and iron ore deposits in Kyrgyzstan’s Naryn and Jalalabat provinces. 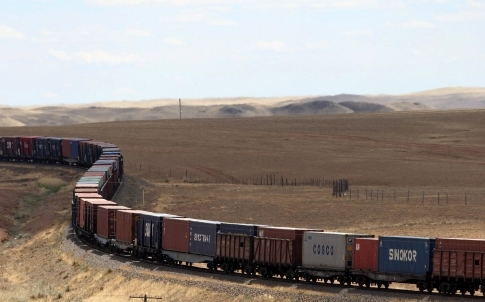 For Uzbekistan, the new railroad is crucial for cementing its strategic partnership with China, given Tashkent’s complicated relations with Europe, Russia and Kazakhstan as well as war-torn Afghanistan (see EDM, January 14). Thirdly, the railroad project would increase China’s influence in Kyrgyzstan by facilitating Chinese mineral extraction projects and the influx of illegal labor, as well as raising Beijing’s political and economic leverage in Central Asia. Based on these objections, Bishkek desires to prioritize a north-south link instead, which would meet Kyrgyzstan’s domestic economic and political objectives. However, this link is much more costly, and none of the potential investors (e.g., China and Iran) are interested. And against the background of its current socio-economic challenges, Bishkek is running out of options. Therefore, it has already begun to reconsider the Chinese offer while trying to assuage domestic concerns with promises of increased transit fees, the creation of local employment opportunities, 51-percent Kyrgyz ownership of the railroad on Kyrgyzstani territory, as well as a pledge to build wheels-changing stations in Kyrgyzstan (Slovo Kyrgyzstana, March 31; Mtc.gov.kg, February 12; China Daily, January 21). Those in Mongolia opposed to direct rail links to China argue that these transit lines would benefit only a few mining companies, increase the country’s dependency on the Chinese market. Moreover, they contend, such links would make Mongolia a natural resource backyard for China and even facilitate a Chinese demographic influx. Therefore, in order for Mongolia to maintain the policy of “one country, one rail standard,” to develop domestic infrastructure and industry, and to diversify the country’s export destinations, many in Ulaanbaatar also argue the need to prioritize the building of a long domestic northern railway line. The parliament had prioritized these domestic routes in 2010 and again in 2012; but these projects are costly and lack support from foreign investors. As a result, the government has already offered Chinese Shenghua Energy the rights to build an 18-km rail link and is about to finalize the rights to build another connection, which would join the major coking coal deposit at Tavan Tolgoi to the Chinese rail network (Unuudur, April 22, 2015). Railway debates in Bishkek and Ulaanbaatar, the capitals of two fledgling democracies in Inner Asia, will likely persist in the coming years, particularly if political and economic factions continue to be linked to geopolitically based fears of China. But politicians in both capitals are running out of options, given their countries’ increasing foreign debt, vulnerability to international commodity markets, and growing threats of being left out of emerging transcontinental railroad networks. Therefore, both Mongolia and Kyrgyzstan are acquiescing to Chinese investment offers through Beijing’s Silk Road infrastructure development projects. Nonetheless, these railway debates will continue to be complicated by Russia’s own economic and geopolitical interests in the region.